Thank you everyone... i love my place here at averitt and i am what they call dedicated flex... last week was a 6 day week and i racked in 3294 miles.. oh.. i was movin alright.. i love it and my sleep to driving ratio is what i love about this company.. they sure do make sure i sleep and i make sure they get every bit of driving time out of me.. so far i love it!!!!! SO.... after a few weeks of some wild trucking **** that i didnt agree with... i finally went company... OLD SKOOL U WERE RIGHT... i chose averitt and so far so good... i had my first trainer.. we didnt mesh well.. so they gave me a new one.. see how that goes... but i do love it so far... and the company is awsome. Ty Rainy... i appreciate it! 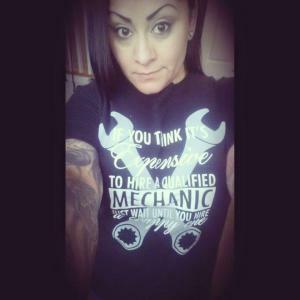 Im very happy for you... add the driving to your mechanic resume and you are going to do great. My dad owned an auto body shop and although i never worked on the cars i learned a lot even as a manager. i think it helped me with trucking. maintaining and diagnosing truck issues was easier. and although this will be frustrating, you have your familys support. you go girl! Ok, we would usually advise taking a little different approach, but hopefully that will all go well for you. Stay in touch if you can, it's been really great having you in here! CDL school complete...on my way to Training and working... Im excited! Im gonna check it out THANKS SO MUCH RAINY!!!!! Awesome!!!! be sure not to put too much pressure on yourself. i wrote an article for those about to test and those who failed. check it out! Jersey Dan finally out on the road ! Ha! Passed my permit test today... rest of my training is menuvers.. and on the road.. exam is in 3 weeks... see ya out there man! Thanks !Nk, good luck in school. See you out here after. That's awesome !nk!! I remember my testing vividly and hope everything feels the same for you! Enjoy your next few months, some will be hard and some easy but all of it will be new and interesting. Cdl permit passed.. dot physical passed... now we are getting behind the wheel today... im super stoked! Any advice? Congratz!!! Cant wait to get out there with yall!!! Staying in shape while driving? Lol where dis u find this list? Im gonna need it BAAAAD! Thanks guys im pretty stoked.. Old school thanks for all the wise words from previous posts i think ur pretty badass! N thanks for the advice amish country... oh yeah and Patrick i live here in Clarksville too. Small world when ur an army family. My husband is a maintenance tech. He has been in about 14 years hes currently stationed at Ft.Campbell. I love it out here. Manual because i like to control the beast in a mechanical way. Im a mechanic and my understanding of a manual transmission is being in the know... when ur driving knowing when to shift .. not have it shift for u. Especially when ur at am upgrade or down grade. So basically to physically BE and tell the motor and trans what i want it to do.. not what it thinks it should do. Just my opinion tho . As far as 13 speed... well honestly i just dont think everyone uses all 18 speeds maybe some but eh. Maybe they do.. Lol my dream truck is a 13 speed kenworth w900 so one day...maybe one day ill buy one..
AUTOMATIC? Manual? Your takes on these transmissions? Paccar? Cummins? Other??? Which do u prefer? Pros /cons? Most of the carriers offering Paid CDL Training Programs will teach in either an 8 or 10 speed manual. For those companies that have phased out manuals you'll be in a 12sp auto-shift. Fuller/Eaton manufacture the majority of transmissions in contemporary class 7-8 trucks. Most of the larger TL carriers are transitioning to 100% auto. In 2-3 years most of the manual transmission trucks will be relegated to spares or training trucks. Good read.. even better information! Thanx!